It’s beginning to look a lot like the holidays … and your outfit may be to blame. For nostalgia-loving college students, no winter social calendar is complete without at least one ugly sweater-themed party to attend. Saving students the time and effort of searching grandma’s attic for the tacky garment, college bookstores now sell their own version — with a college twist. Today’s college remake sports more traditional designs such as Fair Isle, reindeer, snowmen and snowflake patterns, along with the school’s name or logo — and they’re more popular than ever. 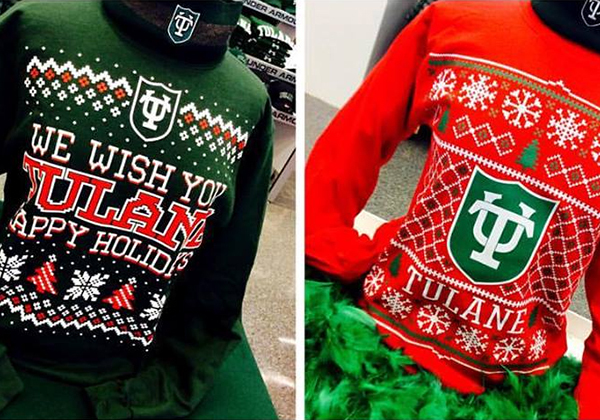 According to Barnes & Noble College research, of the 50% of students who own an ugly holiday sweater, 7% own a “college ugly sweater.” For many, they bring back fond memories of a beloved kindergarten teacher or favorite aunt wearing a loud patchwork of knitted holiday motifs. Who knew ugly could be so popular?